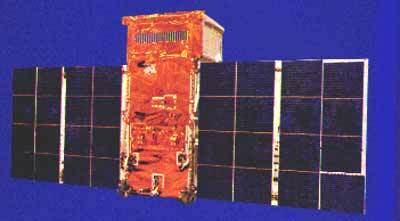 The TD-1 (Thor Delta) satellite - named after the launch vehicle - carried seven experiments devoted to astophysical studies. Its scientific mission was to make a systematic sky survey in the ultraviolet and high-energy regions of the spectrum. The experiments were divided into two main categories: five experiments--measuring ultraviolet, x and gamma rays, and heavy nuclei--scanned strips of the sky; the other two viewed along the sun-pointing x axis and measured solar x and gamma rays. The satellite was a triaxially stabilized platform with the × axis always pointed at the center of the sun with an accuracy of 1 arc min. The satellite rotated around this axis at a constant rate of 1 revolution per orbit during normal operations when sun sensors were used for stabilization but it was spun up during eclipse periods to maintain attitude. The sky-scanning instruments were able to scan a narrow band of the sky during each orbit and the whole celestial sphere in 6 months. Two and one-half complete scans of the celestial sphere were completed before the attitude control was lost in May 1974 following exhaustion of the on-board gas supply. Despite intermittent tape recorder failure, data coverage was achieved over 95 percent of the celestial sphere and many areas were observed during two or three separate scans. The spacecraft was a rectangular structure and comprised a bottom compartment containing the spacecraft subsystems and a top compartment containing the outward-viewing science instruments. It had a cross section of 1 by 0.9 m and was 2.2 m high; its mass was 473 kg including 120 kg of instruments.